1 Baloo Weighted Blanket Review – How Does It All Work? 3 Baloo Weighted Blanket Thoughts – Does It Really Work? Want to relax after a long tiring day, there is nothing better than a comfortable cushioned bed. You have your blanket, your bedsheets, and your pillows to help you relax your body and get better sleep. But, according to some studies, heavier blanks tend to reduce anxiety and helps you sleep better. These weighted blankets are usually made heavier using beads (plastic, cotton) which are then sewn evenly throughout the length of the blank to make it more comfortable and warm. Today in this article we are going to review one of such weighted blank from Baloo. Baloo Weighted Blanket Review – How Does It All Work? The Baloo weighted blanket achieves all the typical benefits of a weighted blanket but with a 100% natural materials. 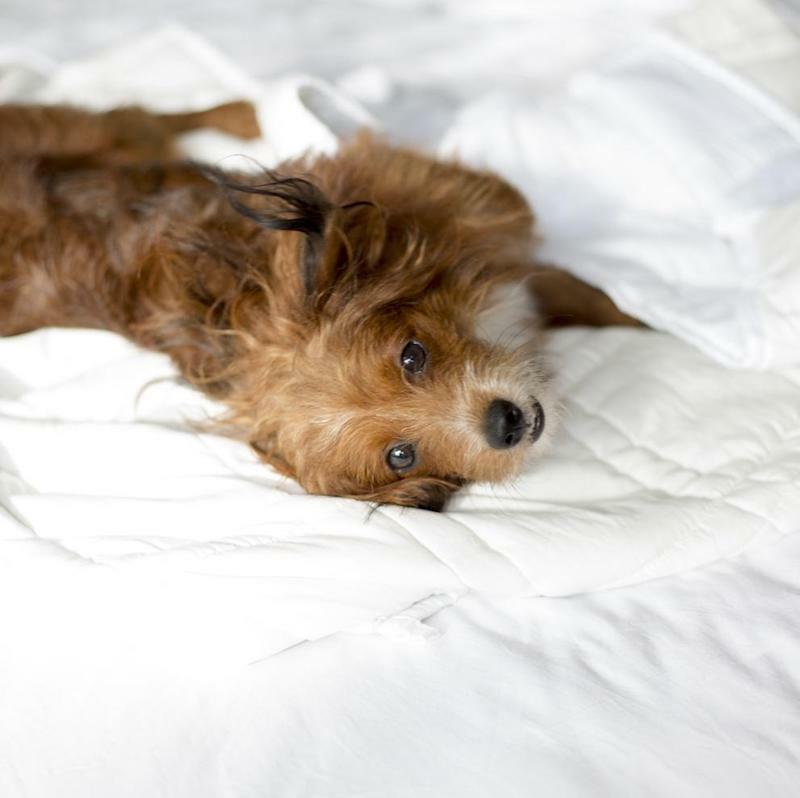 The cover of the Baloo blanket uses chemical-free premium cotton. The cotton is certified by Oeko-Texís 100 standards. This ensures the cotton is free of any harmful chemicals. Inside the blanket, Baloo uses non-toxic and plastic-free wave which is actually quite a challenge to do. Most of the weighted blankets available online on in the market mostly includes plastic in their fill, but the Baloo uses lead-free micro bead blast. The materials are more delicate and give you a more contoured feeling. It also gives you less noisy sleep, and it’s better for the planet. The Baloo weighted blanket uses a deep pressure touch to provide a deep sense of relaxation like a warm hug. The weighted blanket relaxes your nervous system while your brain produces serotonin. This lifts and relaxes your mood serotonin then converts it to melatonin which gives you a great feeling of drifting off to dream. So now that you know a little bit more about the overall quality and comfort of this blankets let dig into the in-depth review. 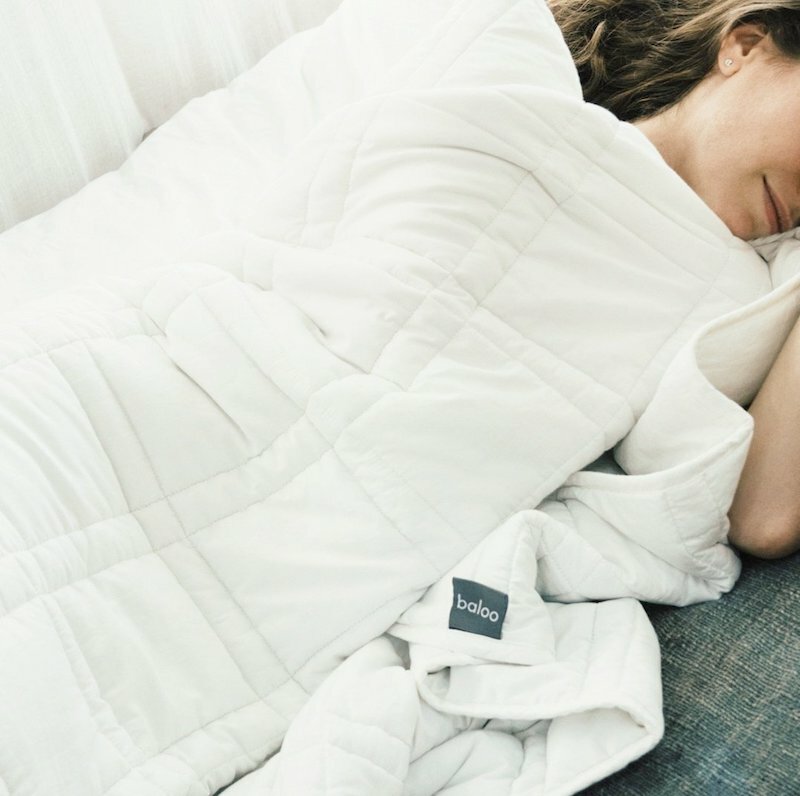 The Baloo weighted blanket comes in a 20-pound and 15-pound variation. Aside from the difference in weight, the two quilts look precisely the same, are the same size, and use all of the same materials. There is absolutely no variation in the quality of the materials used to make this blanket, and the only exception is the weight. The blanket measures 60 inches by 80 inches. This is the exact size of the top of a standard queen size mattress. The blanket only covers the top of the mattress because any overhang would cause it to pull to the floor. 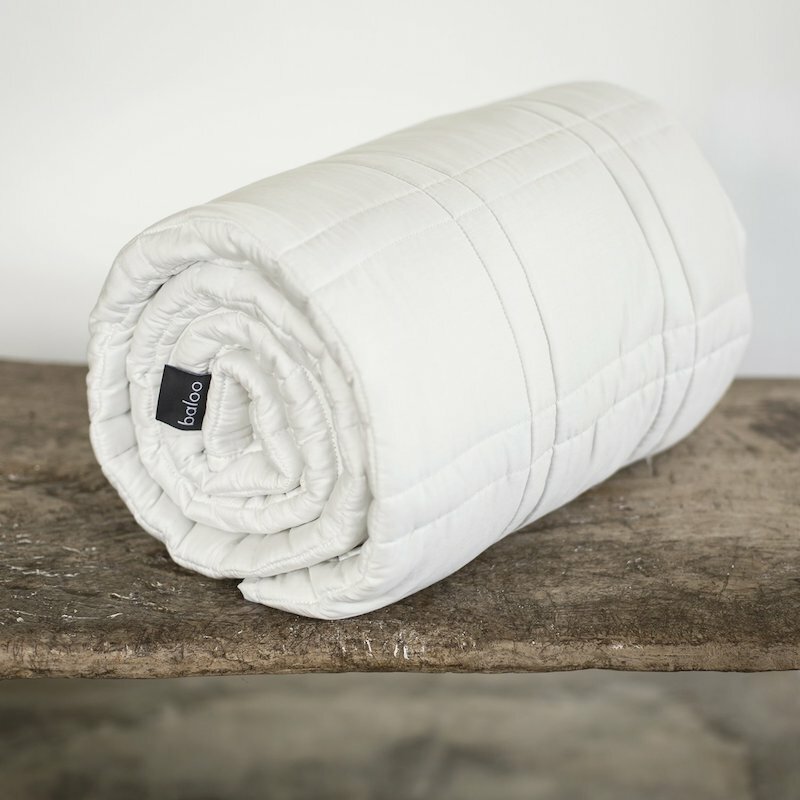 The Baloo blanket is designed with quilted stitching. Not only does this add visual appeal, but it helps hold the weighted elements in place. This means that weight always stays in specific zones and is perfectly distributed throughout the blanket. There are no areas that bunch together. I was able to stay perfectly comfortable throughout the night, and in the morning I felt like the blanket hadn’t moved at all. The weight itself comes from lead-free glass microbeads. Each microbead is very small, but in great numbers, they create a significant amount of weight. They also happen to be very comfortable. It’s not like sleeping under a blanket with a 20-pound dumbbell on top. These beads do more than just add weight. They create a comfortable and moldable blanket. 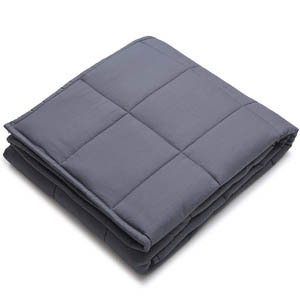 There are many benefits of the weighted blanket as well as the specific materials used. 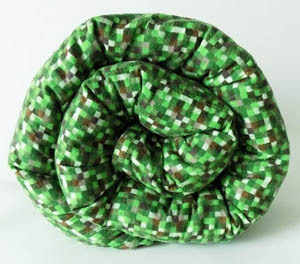 This is actually the only blanket to have met the Oeko-Tex high-quality standard. It uses breathable cotton that is completely free of chemicals. If you aren’t familiar with Oeko-Tex, they are a company that provides very tough certifications to textile products. The materials used must be free from interaction with a long list of chemicals during the manufacturing process. Personally, this certification was one of the first things that attracted me to this specific brand of a weighted blanket. The material used is also easy to maintain and machine washable. I was a bit worried that a weighted blanket couldn’t be washed in my machine, but I was completely wrong. The blanket actually dried quickly on its first dryer cycle. The manufacturer advises against ironing or dry cleaning. I enjoyed the standard white design, but other people may have their own designs or color schemes in their room that they don’t want to ruin. Luckily, the blanket includes a set of six hooks around the edges. You can use these to attach a second comforter on the outside. The additional cover is primarily for looks so that you can keep the existing color scheme in your bedroom. Baloo Weighted Blanket Thoughts – Does It Really Work? The product looks good, and the material feels good, but of course, you’re probably wondering how effective it really is. Should you be buying a weighted blanket? Does it honestly live up to the benefits that it promises? I can say that this blanket performs very well and really did improve my sleep in a number of ways. The major benefit of using a weighted blanket is improved sleep quality. The weight of the microbeads molds naturally to the shape of the body while asleep. It applies pressure and helps you feel grounded to the bed. When I used the blanket, it was some of the deepest and most comfortable sleep that I’ve ever had. There are many people using the blanket for very specific issues. The use of a weighted blanket has been said to improve pain from fibromyalgia, to reduce stress, and to help control anxiety. I cannot personally attest to these benefits; however, if they are problems that you suffer from, then using a weighted blanket is worth trying. It’s important to choose the right weighted blanket from Baloo if you want to maximize effectiveness. As mentioned, they have the 20 pound and 15-pound variations available. Choosing the right blanket is primarily a matter of body weight, though your sleeping style is important as well. The 15-pound sheet is ideal for people who weigh up to 185 pounds or who are side sleepers. I weight over 200 pounds and sleep on my back; thus I used the 20-pound blanket. 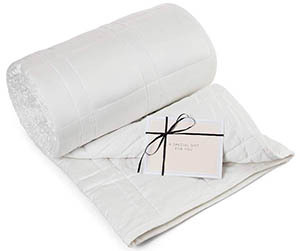 The 15-pound blanket is also recommended for anyone under 18 or over 65. Anyone who suffers from sensitivity in the joints would also benefit from the lower weight. I believe that both blankets will deliver the same high-quality sleep. The use of lower weight is merely a matter of safety and reducing potential pain. 1. 100% pure, non-toxic, chemical-free cotton 1. No color options. The Baloo weighted blanket was not the first weighted blanket I decided to experiment with. I purchased one because the idea seemed intriguing. The first blanket I bought did help improve my sleep, but it had plenty of flaws. For example, the beads used in it werenít soft. By pressing the beads, I knew that they werenít cotton. They were made of foam, and after 1-2 washes, they became stiff and uncomfortable. The Baloo blanket addresses all of these flaws to deliver a weighted blanket unlike any other on the market today. The significant advantage of this blanket is weighted microbead technology. Baloo has managed to find a way to add weight to the blankets while also significantly improving comfort. It perfectly conforms to the body and applies pressure in all of the right places. Other weighted blankets may have had the weight, but they lack comfort. Baloo doesn’t sacrifice either. Overall, I believe this is an excellent investment for anyone who wants to enjoy better sleep. The only additional advice that I can give you is to remember to set your alarms. The Baloo has caused me to oversleep on many occasions so far.